Pressure cookers generate steam in order to build pressure. Liquid is needed to create steam. So in order for your Express Crock to build enough pressure to cook your meal, there needs to be enough liquid in the pot to boil and generate steam. One cup – or 8 oz – of liquid (it can be water, chicken broth, etc) is usually enough liquid to successfully build pressure. Does the Express Crock have a manual function setting? Although none of the buttons on Express Crock are labeled as “Manual” pressure, it is very easy to do. If you have a pressure recipe that requires a manual setting – or if you simply want to pressure cook using your own pressure setting and cook time – then select any of the “One-Touch Meal” pressure setting options below and adjust the pressure and cook time as needed. The PRESSURE ADJUST button is used to select desired cooking pressure (HIGH or LOW). Each pre-set cooking setting automatically selects the optimum pressure for that selection, but it can be manually adjusted with this button. 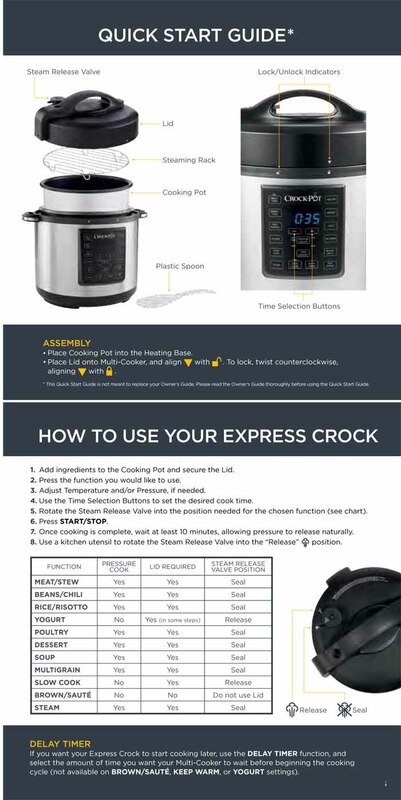 What does the Temp Adjust button on the Express Crock do? The TEMP ADJUST button is used to select desired temperature (HIGH or LOW). The temperature may only be adjusted on the SLOW COOK, YOGURT, and BROWN/SAUTÉ functions. What is the Time selection Button used for on the Express Crock? The Time Selection Buttons (+ and -) are used to set the cooking time. To advance slowly, simply press the + or - button and release. To advance quickly, press and hold the + or - button. If you have passed the desired time, simply press the opposite arrow button to return to the desired time. How does the Delay Timer Work on the Express Crock? If using a pressure function, the word “HEAT” will appear on the display screen until the Multi-Cooker is fully pressurized. When the selected pressure has been reached, the timer will start counting down. What does the Keep Warm setting on the Express Crock do? When cooking time is completed, the Multi-Cooker automatically switches to the KEEP WARM function to prevent overcooking and to keep your cooked food warm until serving - perfect for busy families, those on the run and those who need flexible meal times. This setting is not hot enough to cook and should only be used to keep warm, cooked food for serving. What is the Natural Pressure Release Method on the Express Crock? After cooking cycle is complete, let Multi-Cooker naturally release pressure through the Bobber Valve. Unit will gradually cool down on its own. Wait at least 10 minutes after cooking has completed, and then, using a kitchen utensil, flick the tab on the Steam Release Valve to the “Release” position. Do not place any part of your hand or body over the steam outlet on top of the valve, as steam is very hot and can scald skin. The pressure has been released when steam is no longer escaping from the valve and the Lid opens freely with minimal force. Only then is it safe to remove the Lid and serve food. What is the Quick Pressure Release Method on The Express Crock? Using a kitchen utensil, flick the tab on the Steam Release Valve to the “Release” setting. Steam will release rapidly from the Steam Release Valve. Do not place any part of your hand or body over the steam outlet on the top of the valve, as steam is very hot and can scald skin. Never use this method when cooking liquid ingredients such as casseroles, stocks and soups. For these, please use the Natural Release Method, waiting at least 10 minutes after cooking is complete to rotate the Steam Release Valve. Never use this method when cooking rice, as rice tends to be very delicate. 1.Do not force the Lid to open. If it does not open easily this means that the Multi-Cooker is still under pressure. 2.During cooking, steam will build up in the Multi-Cooker, so when lifting the Lid use a kitchen glove or mitt to protect your hand. What are the Cook Functions on the Express Crock? How can I change a setting during cooking? Press the START/STOP button and then select the new desired cooking function. A new timer will flash on the Display Screen, and the selected function will also flash. Select the desired time, pressure, and/or temperature. Press the START/STOP button and the new function will begin preheating. How can I change the cook time? You can change the cooking time before cooking begins by pressing the + and - buttons before pressing START/STOP. Press and release to change slowly. Press and hold to change time quickly. If you pass the desired temperature or time, press the opposite button. How can I change the pressure? You can change the pressure on certain pre-set functions before cooking begins by pressing the PRESSURE ADJUST button before pressing START/STOP. How can I change the temperature? You can change the temperature on certain functions before cooking begins by pressing the TEMP ADJUST button before pressing START/STOP. Is there a minimum or maximum content level? Yes. When using a pressure cooking function, there should be at least 8oz of liquid inside the Cooking Pot. When slow cooking, the Cooking Pot should be 1/3-2/3 full for optimum cooking results. If you receive this code while using one of the pressure cooking settings, then the lid probably did not close or seal correctly. 1. Rotate the Steam Release Valve to the “Release” position and wait for the unit to de-pressurize. 2. Take off the lid and look underneath to make sure the Sealing Gasket (large rubber ring) is properly secured to the underside of the lid. 3. If your recipe looks like it may need more liquid now that you have released some of the steam after removing the lid, then add more, stir your ingredients, and reattach the lid, making sure the Steam Release Valve is in the “Seal” position. The Multi-Cooker will stop the cooking cycle. Unplug Multi-Cooker, and allow to cool down completely. Once Multi-Cooker has cooled down, check cooking pot to ensure there is enough liquid inside. Add more liquid if necessary (Minimum 8olz). Ensure no steam is coming out of the Cooking Pot before placing Lid back on the Multi-Cooker. Turn Lid to LOCKED position. Ensure Steam Release Valve is in “Seal” (Closed) position. Select a pressure cooking function, and press START/STOP. This notification occurs when the Express Crock attempts to begin a new cooking or pressurization cycle after it is already pressurized. 2. If your recipe looks like it may need more liquid now that you have released some of the steam after removing the lid, then add more, stir your ingredients, and reattach the lid. 3. If you were using a pressure setting, make sure the Steam Release Valve is in the “Seal” position. Otherwise, the Steam Release Valve should be placed in the “Release” position if you were trying to use a non-pressure setting (like Slow Cook). This code appears when either the lid or Steam Release Valve is being used incorrectly for a non-pressure cook setting. Please note that the lid should never be used when using the Brown/Sauté setting. When using the lid during the Slow Cook or Yogurt settings, the Steam Release Valve must be turned to the open or “Release” position. If you receive the E5 Notification during any of these situations, then simply remove the lid while using Brown/Sauté, or correctly position Steam Release Valve to “Release” while using Slow Cooking or Yogurt, and then unplug the unit for at least 5 seconds, re-plug it in and re-program your cook settings to begin cooking. What does the E6 notification code mean on the Express Crock? When pressure cooking, ensure there is a minimum of 8oz of liquid in the Cooking Pot. Never fill the Cooking Pot past the MAX line. Do not leave Multi-Cooker plugged in when not in use. Make sure Multi-Cooker is kept away from cabinets and walls when in use. The Cooking Pot is designed to be used only in this Multi-Cooker. Do not use on stovetop, in microwave, or in oven. The provided Steaming Rack is designed to be used in this Multi-Cooker. It should not damage the surface of the Cooking Pot. When removing the Lid, use a pot holder to grasp the Lid Handle and lift away from your body to allow steam to escape. To ensure lid is fastened in locked position, place the lid upon the Multi-Cooker and be sure that the downward facing arrow (on lid) aligns with the unlocked symbol. To lock, turn counterclockwise aligning the downward facing arrow aligns with the locked symbol. Your cooking cycle is likely complete, causing the Express Crock to naturally release pressure. Wait at least 10 minutes after cooking has completed, and then, using a kitchen utensil, flick the tab on the Steam Release Valve to the “Release” position. The pressure has been released when steam is no longer escaping from the valve and the Lid opens freely with minimal force. Only then is it safe to remove the Lid. Do not force the Lid to open. If it does not open easily this means that the Express Crock is still under pressure. Only release the steam when using the “Quick Pressure Release Method.” Do not use the Quick Pressure Release Method when cooking foods with high liquid content (soup, stews, etc.). For these, please use the Natural Release Method, waiting at least 10 minutes after cooking is complete to rotate the Steam Release Valve. Is the pressure release knob supposed to whistle? When you rotate the Steam Release Valve, there may be a sound from the release valve and it may sound like a whistle. It is only safe to remove the lid, when the pressure has been released and when steam is no longer escaping from the valve. The lid should also open freely with minimal force. For pressure cooking, one cup – or 8 oz – of liquid is usually enough liquid to successfully build pressure. Please follow the instruction manual and designated fill lines to determine how much liquid to use in the Express Crock.